Preparation time: 30 minutes. Chilling time: at least 1 hour. Standing time: 1 hour. 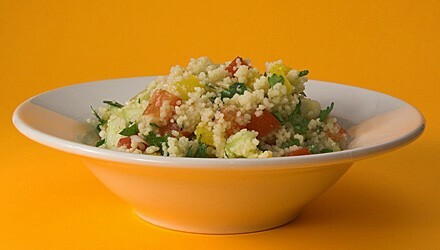 In a bowl, pour water over bulgur, stir, and let stand 1 hour (most of the water will be absorbed). Drain off any remaining water and discard. In a small bowl, whisk together oil, lemon juice, salt, pepper, and garlic. Drizzle over bulgur and mix with a fork. Stir in onions, garbanzo beans, carrot, tomato, cucumber, and parsley. Toss to coat well. Cover and refrigerate at least 1–2 hours to allow flavors to blend. Toss before serving. Tastes great leftover. Exchanges per serving: 1 starch, 1/2 fat. Carbohydrate choices: 1.